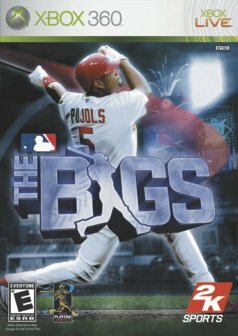 I just played The Bigs by 2K Sports on the XBOX 360 and have to say without a doubt this is the best baseball game ever! Many people find baseball very boring and it’s understandable when some games are 3.5 or 4 hours long with multiple pitching changes. The game can really drag sometimes. So instead of making the most realistic baseball game 2K Sports has added a little flare to their latest release. In The Bigs teams gain big play points and turbo power. Big play points are accumulated by getting hits, being hit by a pitch, and turning double plays to name a few. Once you’ve accumulate enough big play points you can go into big power mode on either offence or defence. The result on offence is almost a guaranteed “moon shot” homerun. If you are pitching and use big power your fastball can comes across the plate at 120mph. Each time you strike out a batter in big power mode you steal some of your opponents big play points. Turbo power can be obtained by throwing strikes when pitching and batters can power up by not swinging at balls. Turbo can be used at anytime as long as the bar is green. When at bat, turbo forces the pitcher to throw a strike and puts a little umph behind your swing. It can also speed up your runner when you are trying to leg out an infield hit or steal a base. On defence turbo will give the pitcher more power and bring back any pitches he has lost. Additionally it will give your infielders more speed and power on their throws. There are also mini games inside the game. When a homerun is hit the area will be marked on the wall. If you can get your outfielder to the wall before the ball gets there and hit the A button your player will start to climb the wall. You will be presented with a button combination that must be completed correctly in a short time period. If you do it right your outfielder will jump high above the wall and bring the ball back in the park robbing the hitter of a homerun. On a play at the plate the game will focus in on the runner and catcher and present a meter. This is a little like a tug of war. Both players have to hit the A button as fast as they can to move the meter to the Runner or the Catchers side. Whoever hits the button the fastest will win the collision at the plate. As I mentioned this game is a ton of fun even if you are not a big baseball fan. It is real enough to impress the baseball die hards and arcade enough to attract any sports gamer.